I figured, "Why not ask?" At a rally in Seattle for Senator Patty Murray, the President used the touchscreen on my iPad to give me his autograph. The rally was Thursday, October 21 at the University of Washington. At first, the Secret Service was a little leery about the idea (as you can see in the video), but they must have warmed up to it, and the President thought it was a cool idea. He looked slightly surprised to start, but proceeded to use his finger to autograph the iPad using the Adobe Ideas application. 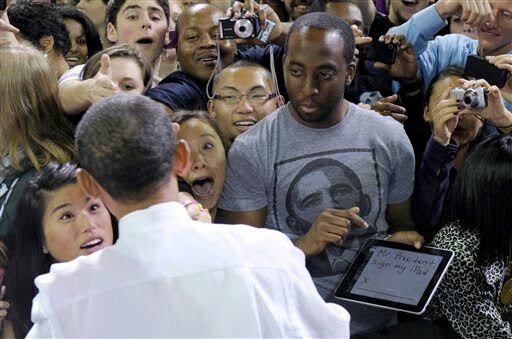 This HAS to be the first time an iPad has received a Presidential autograph, and maybe the first time US President has given a digital autograph. Pretty cool! I put this site together because the response to the event has almost been overwhelming. I've received calls and emails from the almost every media source, people interested in technology, and people who just think the story is fun.